Good news! You sent off your book proposal to a literary agent, and he liked it. Better news! A few days later, despite your doubts, the agency contract arrives in your mailbox. You open the envelope, and lay out the document on your dining room table. And there it is, staring at you, taunting you, begging for your signature. 1. Everything you write for publication, must go through us. Although, the definition of "everything" could vary from place to place. Like many agencies, we only handle books. If you want to write blogs or articles or screenplays without us, have at it. In fact, we hope you do. Such things will only increase your market visibility, which all counts as goodie points when I submit your work to publishers. 2. You promise that you really wrote this book, and didn’t copy it from someone else. We’ll take your word for it, but if you get in trouble, you’re on your own. 3. We won’t start pitching your manuscript until we agree that it’s ready. We love your book, but it might not be quite ready for prime-time. We could ask for another draft, but if it never comes together, we won’t send it out. We like you, but this is business; our name is on it, too. 4. We might ask you to consult a freelance editor, and pay their fee yourself. Some agents will help with editing, and some won’t; but in any event, it’s not our job. 5. We get 15% of everything… Your book could create endless opportunities for movies, toys, t-shirts, video games, whatever. (Who knows what someone will think up next?) We can help negotiate those “subsidiary rights” for you. 6. …Even if you made the deal yourself. Some writers are happy to work with an agent, but nervous about paying a commission. So they sign on the dotted line, and then try to get a deal on their own. The thing is, we'll always find out. You don’t get to send me into battle, and then go around me. 7. But we might ask for a higher commission on a movie deal. Books, we know. But Hollywood wheel-and-dealing? Not so much. So if someone wants to make a movie from your book, we will partner with a specialist agent and share the commission with him/her. 8. You allow us to receive royalty payments on your behalf, and then forward 85% to you. Some publishers will write two checks upon request, while others will not. You need to trust us. When in doubt, you will always have direct access to the publisher, to check up on us. 9. We can bill you for expenses we incur on your behalf, or deduct it from your royalties. (This is the clause that causes the most angst among new clients.) Typically, this will be for printing and postage on a manuscript that we send to an editor. Of course, almost all publishers allow (or even require) emailed submissions these days, but a few still require hard copy. Remember that we work for free, until we produce something for you. It’s a risk we take, and we need you to work with us. If this makes you feel better: In my three years in business, I have never billed anyone for a thing. Small expenses, I can absorb. But if I have to send off a $16 FedEx overnight package? You’ll be hearing from me. 11. …But we still get paid for deals we already made, or that were in progress at the time. Yup, we did the work, and we came through for you. So we will still be connected for as long as that book remains in print, or the movie or action figure continue to sell. If it’s a series, our association could continue for years to come, like it or not. 12. The commencement of our work will not mean the end of yours. You don’t get to sit back and watch as we work our magic. We’ll expect you to participate in your own marketing. And network in the business. Attend writers’ conferences. Maybe build a website and a blog, to build a following. 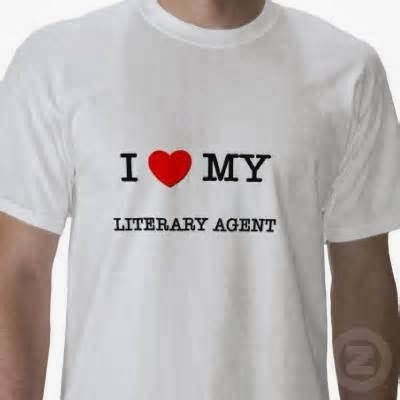 Many authors are suspicious of an agent’s motives; but honestly, our interests are identical to yours. We can’t make a nickel for ourselves, until we make 28½¢ for you. I want one of those shirts! BTW, I love your last line. :) Good stuff, yet again, Steve.